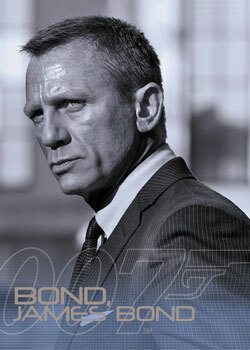 It has taken a while, but Skyfall is finally getting a trading card set. Sort of. 2013 Rittenhouse James Bond Autographs and Relics may not have the acclaimed film in its title, but it plays a major role in the eclectic release. So to do the numerous big-time autographs, a list that includes one very notable TV star signing for the first time. Every box comes with two autographs and a relic card. 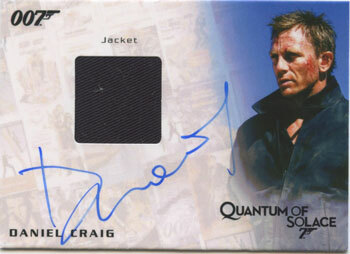 The 2013 Rittenhouse James Bond Autographs and Relics base set is all about 2012's Skyfall. It has 110 cards dedicated to the franchise's highest grossing film. The set includes more than 200 photos. Those looking for a bit of a challenge have two parallel sets to go after. Silver Foil cards are inserted 1:3 packs. Numbered to 100, Gold Foil parallels land one per box. 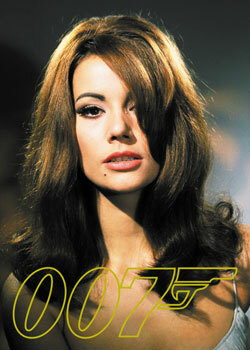 The autograph lineup includes many major names including Bonds Daniel Craig and Sir Roger Moore. Others include Dame Judi Dench, Lulu and Jane Seymour. 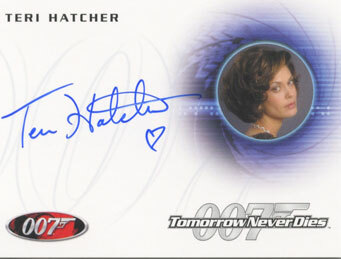 Signing for the first-time in a trading card set is Teri Hatcher. 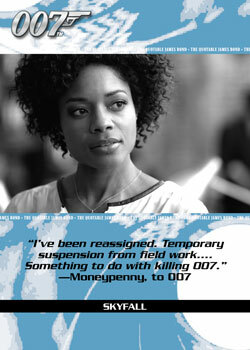 Besides 1997's Tomorrow Never Dies, the actress is well known for her roles on TV's Desperate Housewives and Lois & Clark: The New Adventures of Superman. 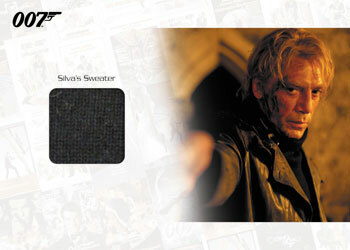 All Skyfall Relic Cards are serial numbered to 200. They include pieces of costumes worn by Craig, Dench, Javier Bardem and many more actors. Relic cards come with up to four swatches. Following in the steps of 2012 Rittenhouse James Bond 50th Anniversary Series 1 and Series 2, this set adds another vintage-style insert set. Goldfinger Throwback is a 108-card set within a set. Every pack comes with one Goldfinger card. 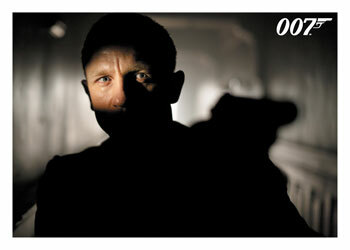 Other inserts include Quotable Skyfall (18 cards, 1:12 packs) and James Bond Gold Gallery (nine cards, 1:24 packs). Gold Gallery cards continue the numbering from previous sets, running #GG39 through GG47. 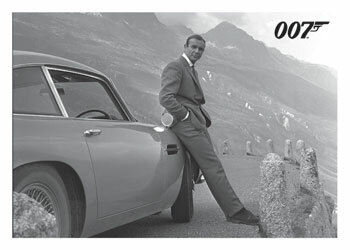 Sold separately, a 2013 Rittenhouse James Bond Autographs and Relics binder comes with an exclusive promo card. 110 cards. 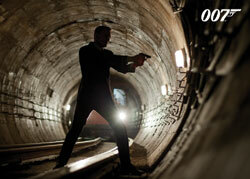 All focus on Skyfall. Shop for base sets on eBay. PARALLEL CARDS: Silver Foil 1:3 packs, Gold Foil #/100 1:24 packs. 110 cards. Inserted one per pack. 9 cards. Inserted 1:24 packs. Numbering continues from earlier sets. 21 cards. Inserted 1:12 packs. 64 cards, #/200. Inserted 1:24 packs. You seem to be the expert on these matters, so a question: Are these Rittenhouse Relics real or fake? In other words, are they real samples of cloth taken from the wardrobe used in the Bond movies– or simply a copy– or even simpler, a photo of the fabric? I haven’t seen one of these up close– just on eBay! So I need some advice before buying. Eric � According to Rittenhouse, they’re the real deal. The one caveat is that some relics use costume fabric used in making the actual piece (ie, the scraps). However, these are noted in the jargon on the back. I believe more and more are the costumes that are being used though, particularly for the newer films. I personally don’t have any concerns about the provenience of Rittenhouse’s stuff. Ryan, do you know where the P1 promo cards are being found (other than Ebay)? Steve Cafiero � Keeping checking this page: http://scifihobby.com/samples.cfm Closer to release, Rittenhouse should have it available for a self-addressed stamped envelope. I’ve been purchasing some of the Rittenhouse James Bond autograph cards on Ebay for severa; months and now am noticing the same sellers offering the same cards repeatedly. Any idea as to whether these autograph cards are easily faked and how to identify an authentic Rittenhouse card from a fake? mike � The past five years or so Rittenhouse added a watermark to the back. If you tilt the cards, there’s a repeating pattern. I’m not sure which set this started with but even then there was some overlap between cards they had signed beforehand and new ones.